The thought of taking scissors to your own hair might terrify you. Many women have had a scary experience with a home haircut and have vowed to never clip their own hair again. Bangs are the exception to that rule because fringe grows super fast. Here’s how to trim your bangs between haircuts. Brush or comb through your entire head of hair. Sometimes fringe can get trapped up with the rest of your hair. A simple comb-through will make sure it all falls in front of your face, rather than gets left behind. 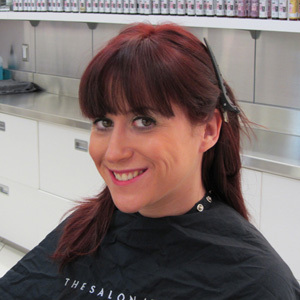 Starting from eyebrow to eyebrow, grab the hair that you want to cut, says ULTA salon manager Rosalie DiMaggio, based out of Rego Park, New York. “Section a ‘V’ in front of your face,” she says. It might seem like a no-brainer, but be sure to section the hair you don’t want to cut as well. Pull your hair back into a ponytail or bun, and from there, clip back the strands you want to keep long. Avoid making mistakes by taking the opportunity to take them out of the picture. Starting with small clips at first, trim your bangs into their desired shape. Remember, you can always trim more hair, but you can’t put it back on once you make a mistake. Make sure the cuts you make are well thought-out and deliberate. Avoid mistakes by thinking ahead and wondering, “What will this next snip do for the shape of my hair?” Side-swept bangs should be cut at a slight angle while straight-across bangs should be cut directly in front of your face. Avoid the temptation to pull on the hair. It will make your bangs look longer than they actually are, causing you to trim more than needed. Now that you’re done trimming, take a look at the state of your bangs. Are they still too long? Do they frame your face properly? Do you want a different shape? If you cut your bangs wet, try drying them to get an accurate read on how they’ll look once they’re styled. From here, you can clip a bit more or decide to be happy with your job well done.